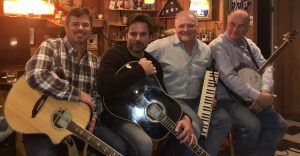 The few times a year Charles Esten returns to Alexandria to visit friends or spend holidays with family, his first stop after the airport is usually Atlantis Pizzeria & Family Restaurant in the Bradlee Shopping Center. “Bradlee, this was my stomping grounds right here,” Esten said from a booth in Atlantis, sipping coffee under the disguise of a baseball cap, surrounded by Sunday morning breakfast-goers. In Alexandria, he’s known as Chip Puskar, a T.C. Williams graduate and class clown who grew up doing improv, playing football and performing with bands around town. Permanently based in Nashville, Tennessee with his wife, Esten is back in Alexandria not only to celebrate Thanksgiving with his family, but to perform at the Birchmere this Saturday and Sunday. 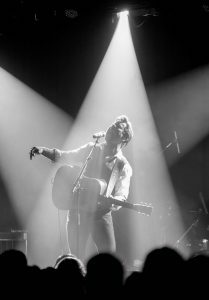 “Willingly or not, these people were all my first audience when I was joking around or playing music as a kid, so it’s really just the best to get to come back, especially in a great venue too,” Esten said. Born in Pittsburgh, Esten moved to the Rosemont neighborhood in Alexandria with his family when he was in third grade. He said he and his sister – local land-use attorney Cathy Puskar – had to acclimate to a new city and school while going through their parents’ divorce. Growing up attending Alexandria City Public Schools, Esten said he was known as a clown, accumulating several “wittiest” and “class clown” superlatives over the years. He said he found an outlet for his humor in various talent and improv shows, once performing at Wolf Trap in a children’s festival. Esten said his lifelong aptitude for comedy contributed to his decision to pursue acting. Roddy Ring, the guitarist and banjo player for Jones Point, said his first memory of Esten in high school was of him clowning around. Esten said reuniting with those lifelong friends like Ring was one of his favorite parts about returning to Alexandria. One thing Esten said has become a ritual is meeting up with the members of Jones Point to hang out and informally play music. In addition to Ring, who graduated from T.C. 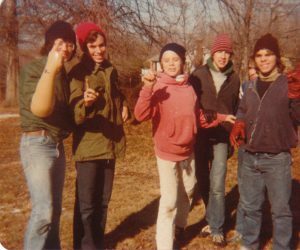 Williams with Esten in 1983, Jones Point is composed of Art Schmalz, who graduated in 1984, and John Leary, who graduated in 1987. The band’s current drummer is Dennis Whelan, a 1983 Bishop Ireton graduate. 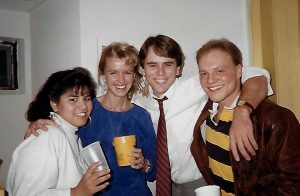 After high school, Esten, Schmalz and Whelan attended the College of William & Mary. 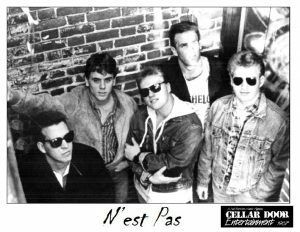 The three joined the same fraternity, Theta Delta Chi, and formed the band N’est Pas, successfully touring around Virginia and North Carolina. Whelan was also Esten’s first roommate when he moved to California after college. 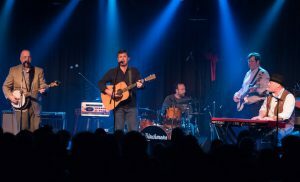 While the group members have played in various bands over time and taken different career paths, Schmalz said their common thread was Alexandria. “The paths kind of wind around and cross and circle back among one another with all these connections that go way back, and you can ultimately trace all the way back to Alexandria and our childhood,” Schmalz said. After moving to California, Esten got his “break” into the industry with a theatrical debut as Buddy Holly in a London production of the musical “Buddy” in the early 90s. He said it was his high school friends Kieran and Dermot Mulroney and Diedrich Bader who motivated him to pursue acting as a career. Like Esten, Bader and the Mulroney brothers have starred in numerous films and TV shows over the years. At his shows next weekend, Esten said he plans to pay tribute to Alexandria with certain songs that make him think of home. Leary, Jones Point’s lead vocalist, said the band is excited to perform in front of a familiar audience. Esten said it’s his relationships and his ties to Alexandria that make the Birchmere performances special.